The veteran population in Reno has been on the decline. According to the latest Census statistics, the number of civilian veterans living in Reno between 2000 and 2013, dropped by approximately 18 percent. But organizations that service veterans are seeing quite the opposite. 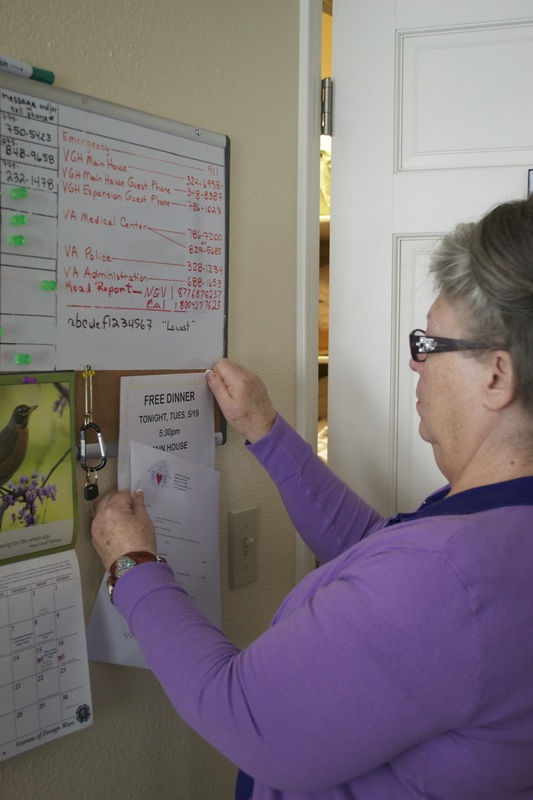 “We really haven’t seen a decline in people,” said Kathi McGathey, House Manager of the Veterans Guest House in Reno. Located across the street from the Veterans Affairs Sierra Nevada Healthcare System, the Veterans Guest House provides a home away from home for those veterans who need a place to stay while undergoing medical treatment in Reno. Most of the houseguests live outside of the Reno city limits and often travel hours to get to their treatment. “I’m here because I’m going through cancer treatment, radiation, and chemotherapy,” said Dave Morris of Silver Springs in Lyon County, more than 40 miles outside of Reno. 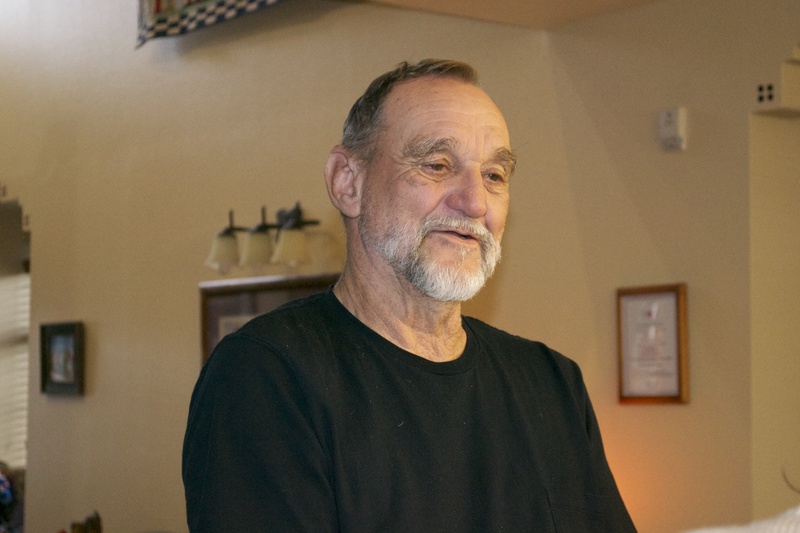 Morris served in the U.S. Army from 1967 to 1970 and has been staying at the Veteran Guest House for four weeks while he receives treatment for colon cancer at a nearby clinic. Morris undergoes radiation and chemotherapy five days a week. Each session is 15 minutes long but the process drains him. “The radiation is pinpoint,” he said. “It’s like a sunburn … so sometimes it gets a little uncomfortable.” On bad days, Morris sometimes needs to stand. He doesn’t go home everyday because the hour­long drive home to Silver Springs can be excruciating . The number of nightly stays at the Veterans Guest House increased from just under 4,000 in 2010 to nearly 5,200 in 2014. Most of the stays are for two to three days but there are instances when veterans and their spouses stay for several months. McGathey said a long­term senior care home for veterans would be better for them. The Nevada Department of Veterans Services is planning to build a veterans senior care center in Sparks that is expected to be open in 2017. Unlike Reno, Sparks is experiencing a slight increase of veterans from 7,296 in 2000 to 7,924 in 2013, according to Census figures. When completed, the Northern Nevada Veterans Home is expected to serve just under 100 veterans and their families. That would help address a bed shortage of more than 375, according to the U.S. Department of Veterans Affairs. The only state­owned nursing care facility for veterans is in Boulder City. The Nevada State Veterans Home has 180 beds and costs veterans $110 to reside there, according to the state veterans department. Comparatively, nearby facilities cost $233 a day. Rick Shuster, Board Chairman of the Reno, Nevada Vietnam Veterans of America, has been advocating for a full­fledged veterans home in Reno. “It’s definitely long over due,” he said. There are more than 80,000 veterans residing in Northern Nevada, according to the Nevada Department of Veteran Services. Plans began in 2006 but only recently did Governor Brian Sandoval include a veterans home in his budget for Reno. 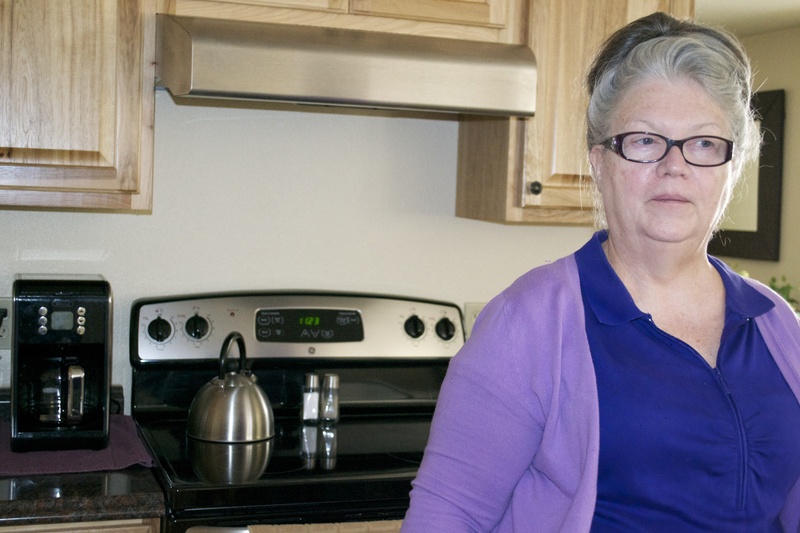 Kathi McGathey, of the Veterans Guest House in Reno, welcomes a long­term facility. “We’re always full,” and she has a waiting list. She sends the overflow to The Sands Regency Hotel in downtown Reno. She said the hotel housed more than 600 veterans for them last year. The idea of this project was to work with data by zip code, something that sounded amazing for me. Right away I went through data, stripping and copying into spreadsheets to comb through it. 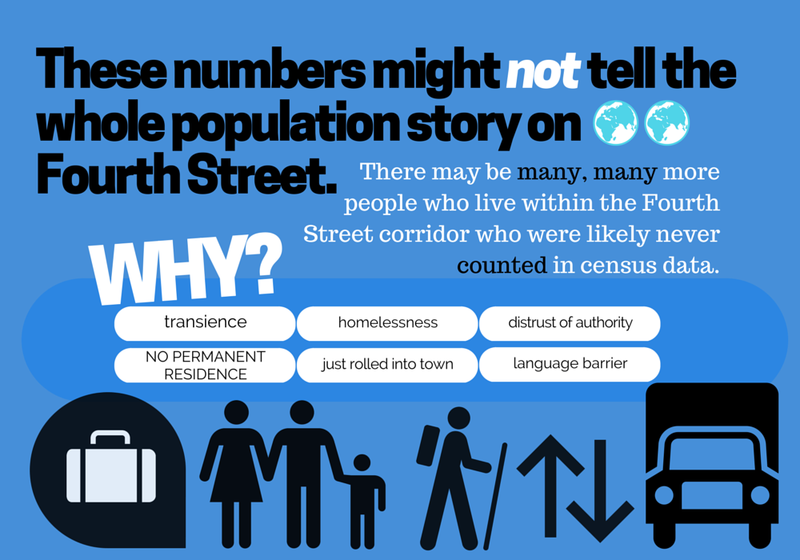 The idea for my initial story, however, came not from the numbers, but a fleeting memory sparked by the data. I was staring at census data on disabled people in my area when I remembered a conversation I’d had with a professor. He conducts research with robots to make advances in the healthcare industry, specifically for children with autism. The professor and his wife were celebrating the birth of their second child during the start of the NPR Boot camp, and understandably, is taking time off from research. Prisoners. Specifically, prisoners at a local restitution center. This idea could have worked had I made the call several days in advance. Protocol. Thankfully, I had done enough research on the topic that in little time I found a transitional housing facility for ex-felons. The place seemed great, and a story was definitely forming before my eyes. But it was day two of the Boot camp and it seemed as though the other students had already begun to get interviews. I was falling behind. This was not pleasing to my ego. So, instead, that Tuesday afternoon my mentor and I decided to pursue a story with the humane society. Apparently, 89431 has the highest number of unaltered animals, so the humane society is hosting a year-long event during which dog owners can spay or neuter their pet for as little as $20. Okay. So, it isn’t the most heartwarming piece, but it was available. The experience was great, and by the end of it I was a fearless journalist, talking to strangers (sorry Mom). Not even the craziest conspiracy theorists could scare me away after that experience. After hunting dog owners for hours, I finally heard back from the Ridge House, and we had our story. We wouldn’t start until Wednesday morning, but hard work and (very) late nights would get it done. I met up with my mentor Vanessa at the facility early that morning, and with her help, I was able to learn a lot and together, gather great sound. Our editor, Traci, helped me find the “golden nugget: to solidify the story, and Catherine Stifter showed me how to make all the bits of sound come together smoothly. My time here has been rough, amazing and I’m so glad I turned in that cover letter. A respected police officer-turned-prisoner finds redemption helping other inmates re-enter society. In Nevada, when a felon is released from prison, he’s given about $30 and the items and clothes he had when he was incarcerated. Transitioning back into society with so few resources can be tough. The Ridge House in Reno is a transitional living facility for felons, offering six different homes for approximately 40 people. One of those homes is specifically for veterans. These transitional homes work with Veterans Affairs to ensure the clients have all the necessary resources to live a successful life. Dan Lisoni is a veteran and former criminal investigator who found himself on the other side of the law when he was arrested and jailed for a series of petty crimes. He says his life took a turn when he became dependent on pain killers to deal with an injury on the job. Lisoni says he was already an alcoholic and it didn’t take much to fall deeper into trouble. He spent almost one year in prison and upon his release, he moved to the Ridge House. That experience inspired him to get a job at the facility once he was released to help other felons transition into society. He likens his job to a parent taking care of children, because he has to ensure his clients are fed, attend appointments on time, and have all the skills necessary to succeed in life. Lisoni says these transitional houses have come a long way since the halfway house of the past. And it’s evident in the numbers. Ridge House has seen a 25% recidivism rate within three years, far outperforming the nation’s average of 75%. The transitional housing program helps keep clients by outfitting them with the proper attire for a job interview as well as how to write cover letters and resumes. According to the Ridge House, they only spend $4,000 per client versus the State of Nevada, which spends upward of $20,000 to house a felon. Lisoni says it’s easy to throw people in jail and throw away the key. It’s more challenging and rewarding when you help them succeed instead. Para escuchar esta nota en espanol, haga clic aqui. Fourth street has had an unfortunate reputation as being a dodgy part of Reno with drug sales, homeless people, and adult entertainment. Today, it looks like a run down street, but this once was a vibrant part of Reno with the Lincoln highway 40 running straight through. “I love fourth street. I really do,” said Hawaii, a middle-aged homeless woman who lives within the Fourth Street corridor. Hawaii is one of many homeless people who regularly come to Fourth street to pass the time, meet with friends, and receive food assistance. But right across the street stands a modern symbol that represents everything that Fourth street is not. 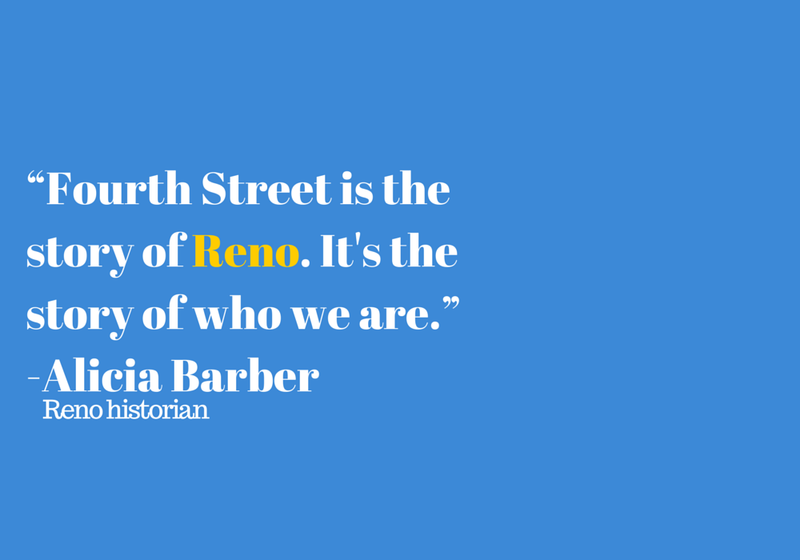 “We can walk out onto the main corridor here,” said Alicia Barber, a historian who has published several works on Reno history. 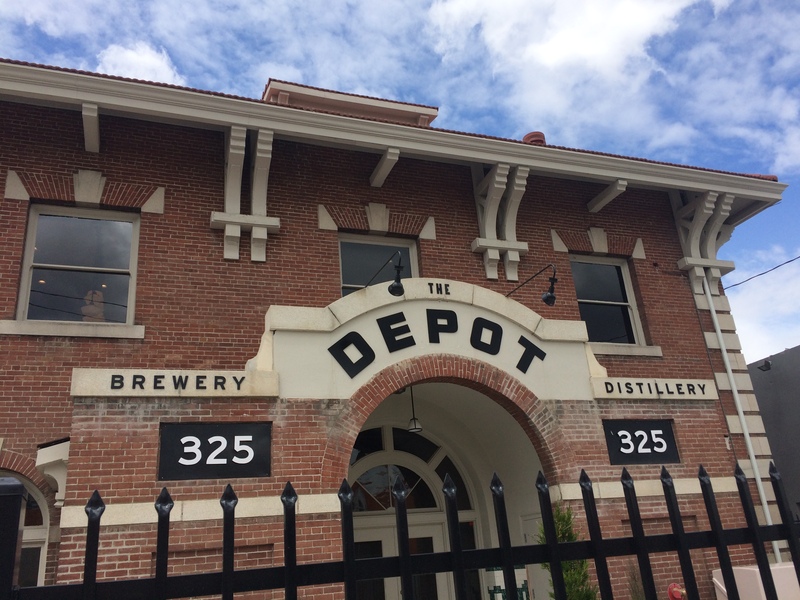 “We’re at the Nevada California Oregon railway depot which was just this past year turned into a restaurant, brewery and distillery, called The Depot. But the building had been vacant for about 10 years. East Fourth street was neglected for so long, after the interstate was constructed in the mid 70s”, said Barber. However, that desolation didn’t last. There’s a change here, and The Depot might be just the beginning. Earlier this month, he and 40 other urban professionals from all across the country came to Reno, in part, to come up with ideas to re-energize Fourth street. The way to give it a push, he suggested, is to start small and practical. That seems easy enough, but for the business owners on Fourth street, it is not that simple. They believe that a few aesthetic changes won’t address the larger social issue. “They see these kind of grungy types and they see the prostitutes walking down the street and people are afraid to come down here,” said Otto Braun. He and Richard Viera own The Cadillac Lounge. The exterior of the Cadillac lounge isn’t much to look at, but inside country Western music fills the small dark room.Regulars sit at the bar smoking, chatting up the bartender Sean and Zack, while the resident labrador happily greets anyone walking in. The Cadillac Lounge is a well-known gay bar, but all are welcome here. And in many ways, it symbolizes what Fourth street strives to be– retro, with old-school character. 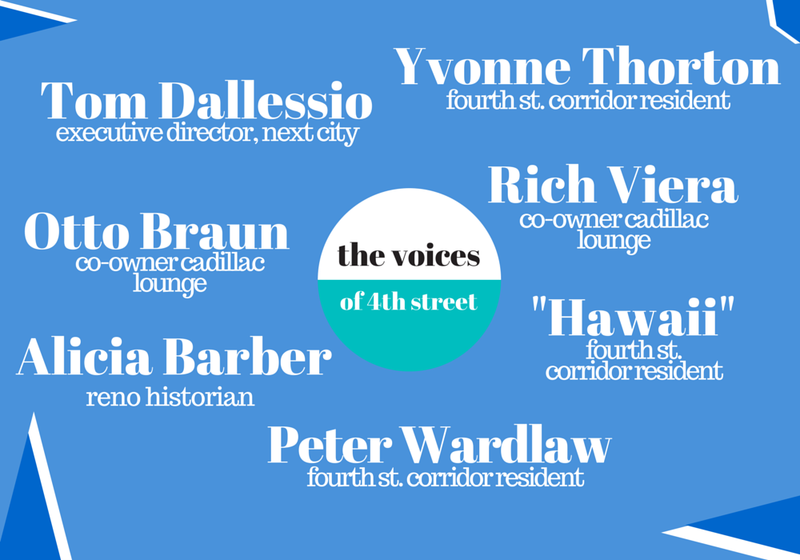 “Fourth street is a little rough around the edges, but we’re very welcoming.” said Braun. The homeless shelter on Fourth street is close to the downtown area. In years past, the homeless were pretty much left alone because people rarely had a reason to visit. Now with plans to clean up the area and with businesses picking up, the two worlds are clashing. She feels that when developers and business owners draft plans to renovate the area, there needs to be a sense of compassion for those, like Hawaii, who call Fourth Street their home.“​I love fourth street… I really don’t want them to kick us out,” she said. Wells Avenue is located in a zip code with the highest population of Hispanics in Reno. The city’s overall Latino population is twenty-nine percent, but here in this southeastern corner, it is forty-two percent. 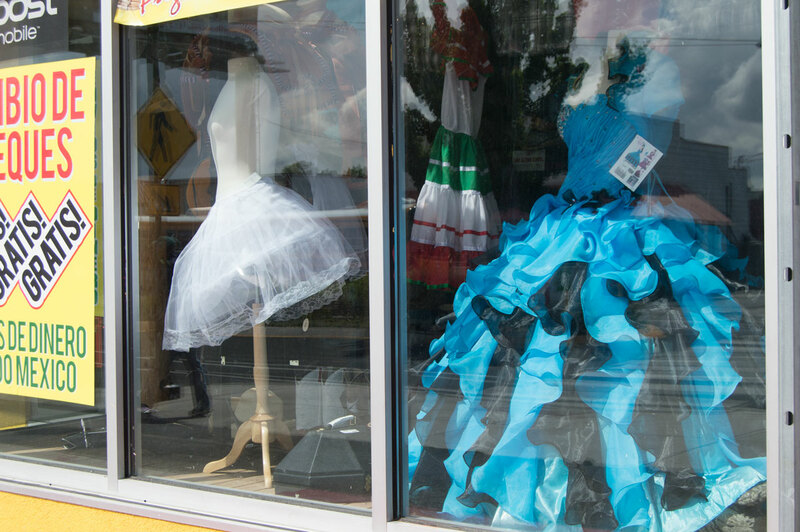 A four-block long stretch of South Wells Avenue has become a destination for Latinos from across the state to buy anything from Quinceañera dresses to Mexican rattlesnake cream, things they can’t find anywhere else. Next Generation Radio’s Sonia Lopez has this story about a street that connects people to their Latino roots. Wells Avenue is the of the heart of the Latino community in Reno, according to Emma Sepulveda, director of the Latino Research Center at the University of Nevada, Reno. When she first came to Reno in 1974, she lived in an apartment right off of Wells. She says back then, it looked nothing like it does today; there were no Latino-owned or oriented businesses. It was for the most part an Anglo neighborhood. Sepulveda says Wells came into existence as a Latino enclave as their population rose in Reno. “The numbers were demanding almost to have a little bit of what we left behind, here in Reno, and I think that is what was really part of creating this change and the creation of Wells Avenue,” she said. When she first arrived in the 70’s, Reno’s Latinos made up only three percent of the total population. 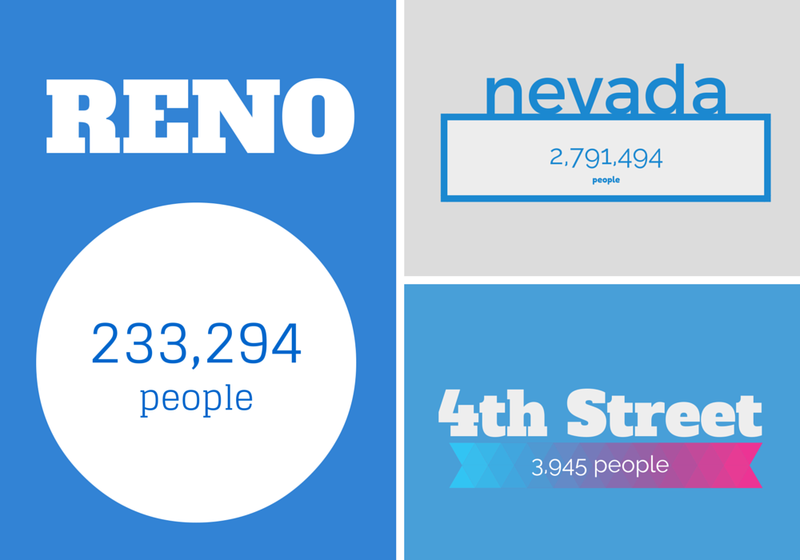 Today, twenty-seven percent of the population in Reno is Hispanic. The zip code with the largest share of that is 89502, the area in which Wells is located. Today Wells Avenue is a thriving diverse community with a variety of business like Latino tattoo parlors, Irish bars, Pupuserias, Brazilian Jiu jitsu, and Marketon. Marketon is a local grocery store which has a large variety of Latino products. 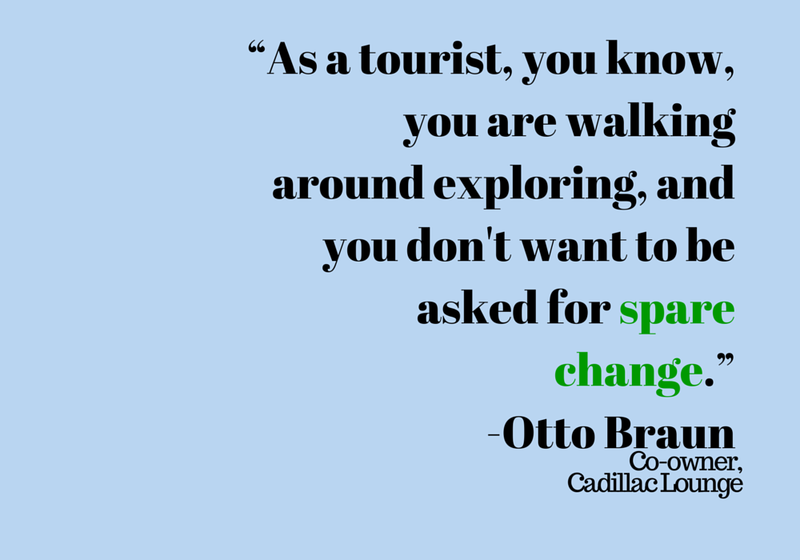 It is not just a grocery store for Latinos, people from different backgrounds shop there too. Sepulveda says when she first lived on Wells, Marketon was not there, it was an Anglo owned grocery store. But as the neighborhood changed, the market was taken over by Latino owners. Even though she doesn’t live in the neighborhood anymore, now that the store has become Marketon, Sepulveda still goes there to shop. She says they have spices she cannot find anywhere else, and she likes the feel of the place. “I just walked in right now and you could see people are shopping like they did in Latin America, you know you don’t come by yourself, you come with your family,” she said. Sepulveda says Latinos come to America because they want to be here, but they also create neighborhoods filled with their culture in order to maintain a connection to home. “We want to assimilate but we still want to have connections of where we came from,” she said. For the Latino community, Wells is a place to make those connections. It has created a bridge that not only unites American Latinos to their culture, but invites others into Latino traditions. 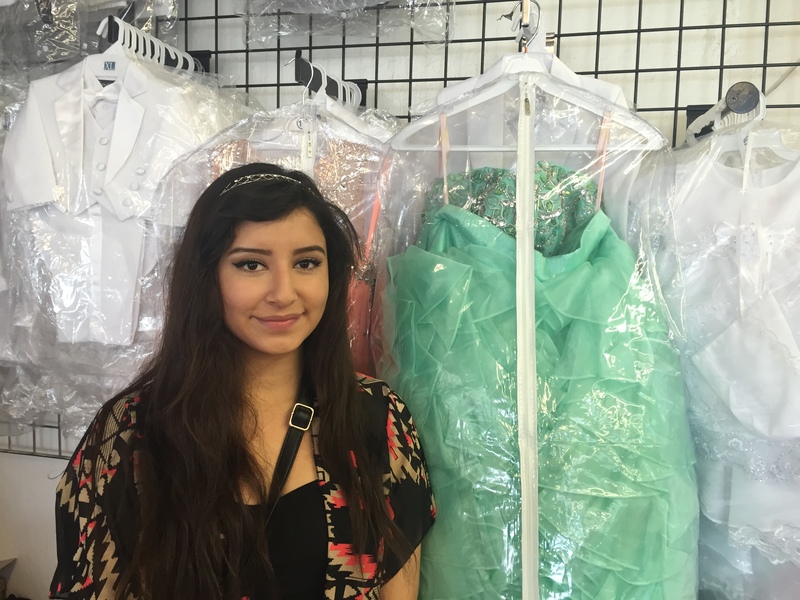 It one of the few places in the region where young Latina girls can come to buy there Quinceañera dresses. The street is full of life and color, decorated by the diversity of the businesses. But the four-block section at the center of the South Wells Avenue does have a majority of Latino shops. According to Sepulveda, about sixty-eight are operating. 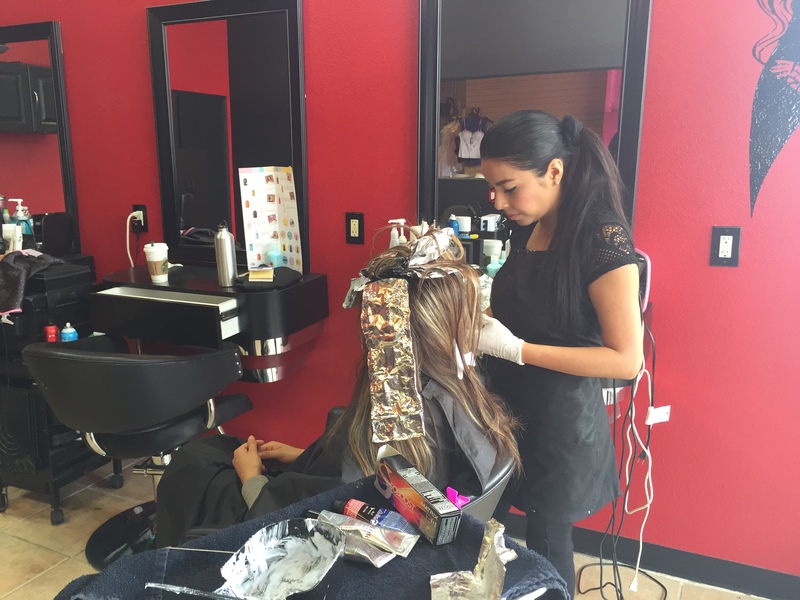 It is not just restaurants, but dress shops, hair salons, notaries, and travel agencies that truly cater to Hispanics in Reno. 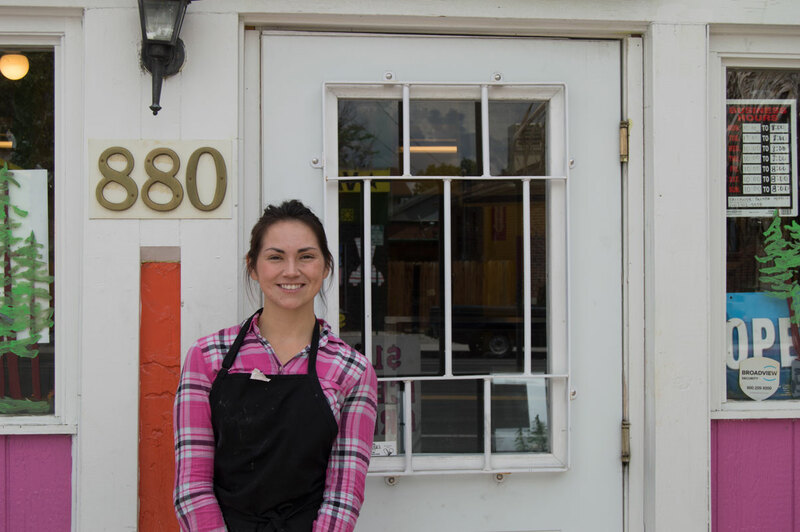 Amber Trudel Werhta and her husband own Paleteria Morelia. A paleteria is a shop that sells Mexican frozen snacks, candy, and drinks. They named it after Morelia, her husband’s home town. Her business specializes in authentic Mexican treats like Horchata, a traditional rice drink. For Wertha opening a traditional Mexican shop on Wells has put her more in touch with her own Hispanic roots. Werhta is a native of Reno. Her father is Mexican and mother is white. She says she didn’t truly learn Spanish until she started interacting with her largely Latino clientele. Marrying a Mexican helped too, she admits. Now she is raising her two children to be bilingual and steeped in their Mexican heritage. Wells allows for Latinos who immigrated from Latin America to find a taste of home. It also helps them pass their traditions on to their children, to not only tell them about their culture, but actually show them. At the start of this project I knew I wanted to do a story about Wells Avenue because I wanted to tell the story of my culture. Being Hispanic and being part of the largest growing minority in the United States I feel like there still is a disconnect between the Latino community and the media. As a journalist I hope to find stories that need to be told, stories that nobody is telling. For this project I wanted to explore a piece of the Latino community’s story in Reno. I grew up in Fallon, an hour away from Reno. When I was a kid we would drive on the weekends to Wells Avenue. My whole family would go and we would buy things we could not get at Walmart, like the leaves to make tamales. We would also get Mexican candy like Lucas. It felt really welcoming and my dad would say “hi” to people, even people he didn’t know. Wells Avenue felt safe and welcoming, it was kind of like being in Mexico. Mexico is a piece of me, and I want to be connected to it. Like I miss my grandparents who live in Mexico. On Wells Avenue I see old ladies that remind me of her, or old men with their Mexican cowboy hats who make me think of my grandpa. And I know, for my parents, it’s so important to feel like they were back home. Wells feels like that. I knew what I wanted to accomplish with my story and I knew where to find the largest Latino population in Reno, but I didn’t know what my story would be or who it would be about. So what do you do when you don’t have a story, but you have a deadline? My mentor Sandhya Dirks and I walked up and down Wells Avenue for two days and met people like me; people who would travel to Wells from different parts of Nevada to find Mexican goods that can’t be found anywhere else. We met local business owners who have been there for almost twenty years, a guy who goes twenty minutes out of his way just to buy tamales at the Latino supermarket, and a girl who drove almost an hour from Reno to get a dress for her Quinceñera. 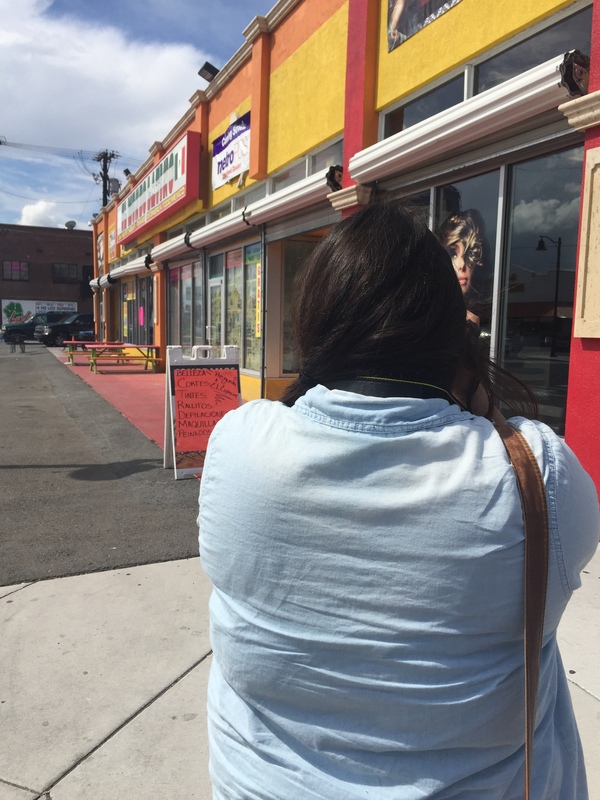 Student Reporter Sonia Lopez takes pictures along Wells Avenue. Let me tell you walking up to people and asking them their story it isn’t as easy as it sounds. Coming into this experience I was doubtful about even applying. I sent my application thinking I probably wouldn’t get in to the program. When I received the email that said I had been picked I literally screamed, which was embarrassing considering I was sitting in my Econ 103 lecture and half the students were asleep. This experience did teach me, and it gave me an opportunity to truly invest time and go talk to people. There were moments where I would forget to introduce myself and explain what I was doing and people would look at me like I was crazy, but that is okay. I can honestly say if I were to redo this project next week I could walk into everyone of the businesses and explain my self and ask my questions and find that story. The scary part for me was approaching people and saying “hey can I talk to you.” But I learned after that it gets easy, because people want to talk and they want their story to be heard. I mean, yes, some people will say no and that is okay too. You say thank you and move on the next person. But for the most part about eight out of ten people are interested and they want to know why you are walking around holding a microphone, recording the cars driving by. As a journalist I just want to tell people’s stories. Stories that aren’t usually told, but I feel need to be told, stories that I believe people need to know. Through this boot camp I learned that its okay to email the same person three days in a row and to be a professional stalker because maybe they are that last voice the story needed and using professional stalker as your job description will definetly intrigue people to want to know more. But the most important thing I learned is that it is okay to tell people your insecurities and your weaknesses, especially when surrounded with mentors who want to see you succeed. They can help turn those weaknesses into strengths.